We are very happy to announce to all of our followers a brand new category of posts. "The Spot" - creates opportunity for visiting creative, innovative, delicious, inspirational places all over the world. It's going to be a close up view for Your future travelling goals. High resolution photos or even videos will give You more accurate details about places we had visited. So get ready for the journey across food, health, sport, culture, design, various people plus many more. LET'S GET IT ON! As a truly adherent of a healthy lifestyle, I'll only recommend the spots I've been visiting in a researchers role. No sponsored articles! Only places where we had direct opportunity to chat with staff, founders or CEO's. No colourized stories. No advertisement illusion. Only pure experience as a conscious human being. Oh and if You have Your favourite places, maybe unusual or well designed spots, give us a shout. We can visit them with our camera to spread the word through creative and open minded communities. I am going to start from a very nice place, where You can relax, get a full body massage as well as face, hand and feet treatments. So my first spot is "Laznia Club" based in Warsaw (Central Poland) at Pulawska Street 119 near to the City Center. Pedicure and manicure - this is the first treatment You can try in Laznia Club. Chummy room with fancy chair where You can relax and be sure everything will be done perfectly. I haven't been try this type of activity but after a short conversation with one of the staff member I admit this sounds awesome:) Especially when they use some natural mixes of aloe, herbs, seaweeds and therapeutic oils to make You look greater. But not only this. Your mind can feel more free from everyday struggles as well. Another feature is face and body treatment. 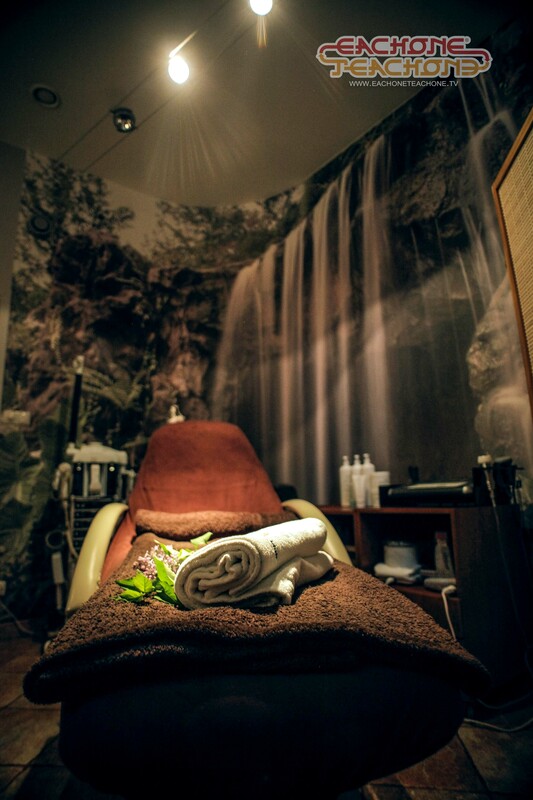 In this special room You can rest and let yourself flow with the movement of staff's hands. Special line of natural cosmetics will make You Adonis:) Many simple details are perfect creating the whole vibe: an elephant with trunk up remind me symbolic meaning of success. Fresh flowers adapt perfectly what makes this room even more natural (instead chemical air freshener). And now lets get to the main point: Saunas! This is why I visited "Laznia Club". I was looking for some nice and calm place where I could chill and relax my muscles after everyday dance lifestyle routine. The place looks like from The Lord of The Ring movie: lots of specially designed walls and rooms. It makes You feel like You are visiting extraterrestrial chamber. We have 3 saunas: 2 dry and one steam. And the last but not least: massage room which we can visit walking down the stairs to the underground cave-style area. Original place not only because of the design and vibe. But also about what this area offers to our body and mind up to 15 different type of massages inter alia: relaxation, sport-style, lymphodrainage, Thai foot massage, warm rocks therapy plus more. I'm impressed about "Laznia Club". I've been visiting many saunas in Warsaw and this one is [highlight]one of my favorite! 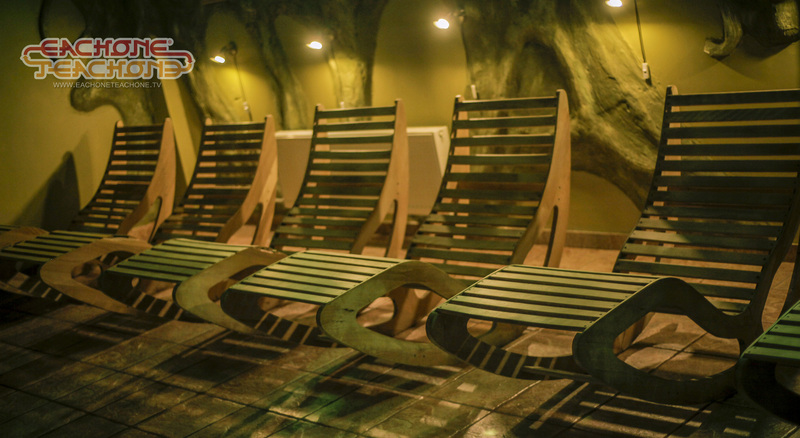 [/highlight] In the ocean of sameness in Wellness and Spa services in Poland, this place is totally out of this world! Front desk is a perfect example of how the real customers service should look like. You can feel as someone important, as a beautiful individual - not as a next random client. You can feel radiation of positiveness! Tagged be-in-shape, befit, dry sauna, health, health and fitness, klub łaźnia, laznia club, łaźnia klub, massage, puławska, sauna, spa, steam sauna, thai massage, warsaw sauna, warszawa, wellness and spa, welness. Previous: Look at this, look what she wrote me, Doc.